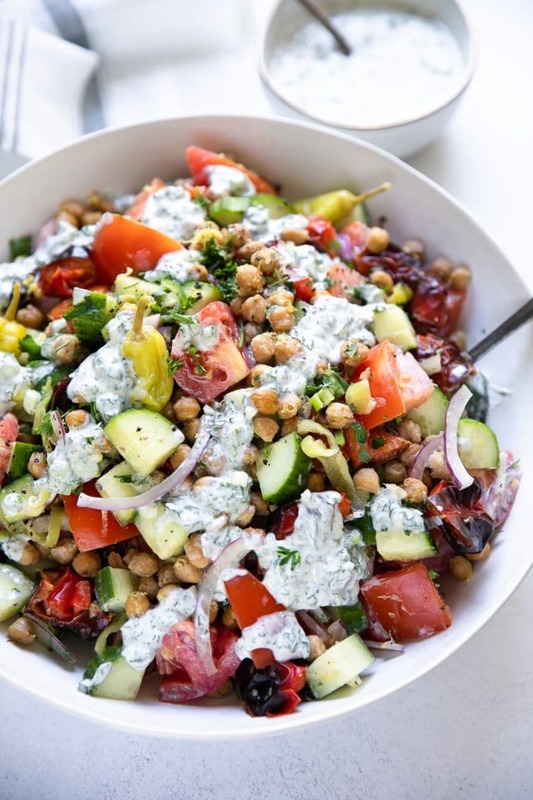 This Chickpea Tomato Salad Recipe with Creamy Yogurt Dressing is a fast, fresh, and healthy vegetarian salad packed full of roasted chickpeas, crunchy cucumber, red onion, tangy pepperoncini, juicy tomatoes, and spicy serrano peppers. Drizzled with a creamy dill yogurt dressing, this awesome Chickpea Tomato Salad is perfect as a side, main course, or potluck addition. 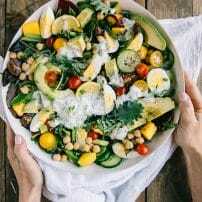 Salad recipes taste perfect when paired with a little Creamy Yogurt Dressing and include this Veggie and Shrimp Salad with Avocado Cilantro Dressing, Mango Avocado Salad with Creamy Yogurt Dressing, and Oven Roasted Carrots + Chickpeas with Farro and Lemon Yogurt Sauce. Jk, who do you think I am? This yogurt dressing is literally everything. Of course, each individual component to this salad is delicious, but the herb yogurt dressing is the glue that brings it all together. This salad has three main parts- the roasted chickpeas, the creamy yogurt dressing, and the main salad. Don’t worry, it’s not as scary as it sounds. Even the most beginning at-home-cook could whip together this salad no problem. THE CHICKPEAS- unlike other crispy roasted chickpeas I have made in the past, these have been kicked up a notch with none other than…lemon zest. This tiny, humble addition makes a huge difference and comes highly recommended. I’m surprised any chickpeas made their way to the salad as I could not stop eating them as soon as they finished roasting. THE MAGICAL CREAMY YOGURT DRESSING- even if dill isn’t your favorite herb on the planet, I am begging you please! do not leave it out. While I date hate dill, it definitely isn’t my number one herb of choice. For this magical yogurt dressing, however, fresh dill is an absolute must. Make it your own. 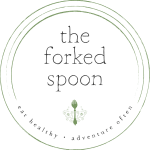 In other words, don’t feel like you HAVE to add the serrano pepper or the peperoncini. And, most important, don’t feel that you can’t add any meat (hint-chicken would go really well here). That said, don’t forget to read the instructions, start to finish, before making the recipe. Add the yogurt dressing just before serving. Or, keep the yogurt dressing separate to prevent the salad from getting soggy. Chop the vegetables into large(ish) chunks. Fresh herbs are a must. I love the convenience of dried herbs, but fresh is best in this case. Preheat oven and line a large, rimmed baking sheet with parchment paper. Thoroughly rinse and drain chickpeas. Dry them. In order to prevent the chickpeas from steaming themselves, you need to make sure they are super dry before roasting them. The easiest way to do this is to gently rub them between paper towels or clean dish towels. The skins will start to peel off- that’s ok. Leave those behind. Toss the cleaned and dried chickpeas with your favorite seasoning and olive oil. Usually, I would add fresh garlic to the mix, but to avoid burnt garlic, I used garlic powder instead. Remove from the oven, toss with some lemon zest and a little olive oil, if needed, and spread out on the baking sheet, to cool completely. 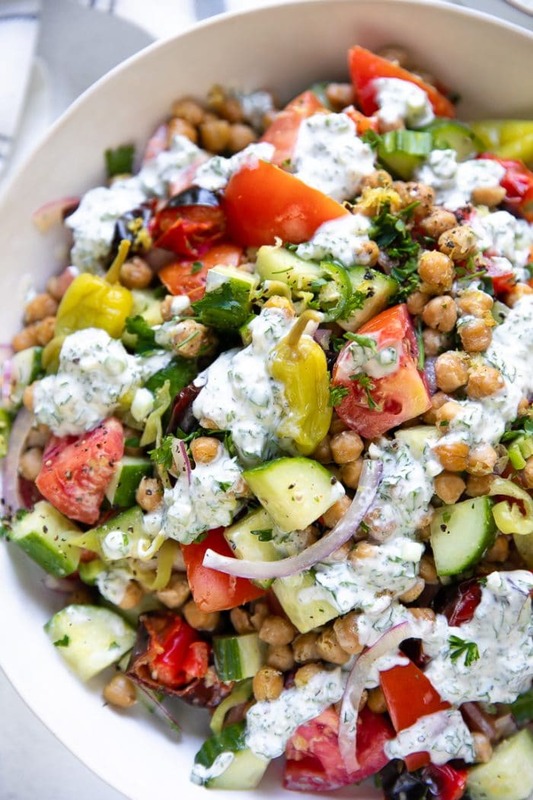 Do you have to roast the chickpeas in order for this salad to taste delicious? no, definitely not. You can totally skip the roasting altogether and simply add rinsed chickpeas. However, I always like to present options. The same can be said for the red bell pepper. 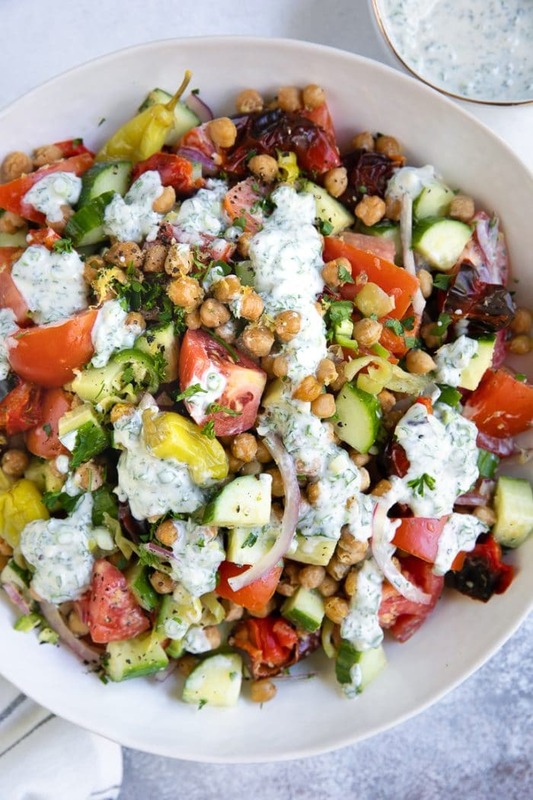 This Chickpea Tomato Salad Recipe with Creamy Yogurt Dressing is a fast, fresh, and healthy vegetarian salad packed full of roasted chickpeas, crunchy cucumber and red onion, tangy pepperoncini, juicy tomatoes, and spicy serrano peppers. 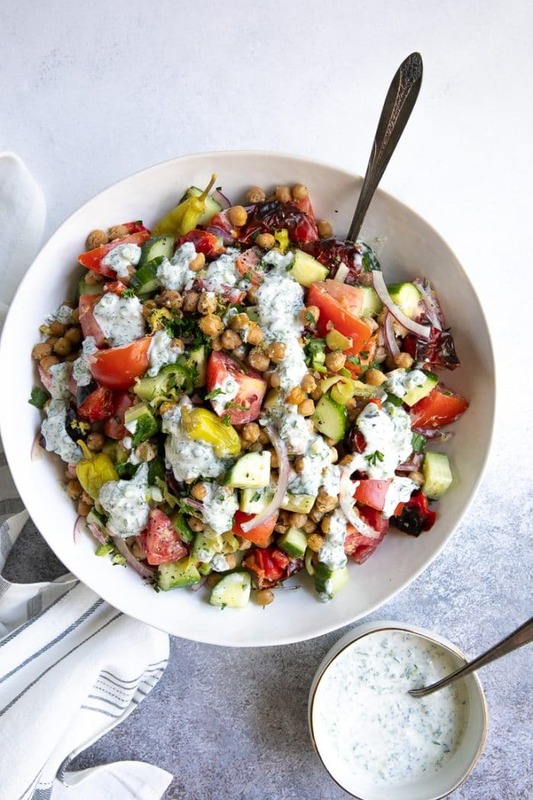 Drizzled with a creamy dill yogurt dressing, this awesome Chickpea Tomato salad is perfect as a side, main course, or potluck. Preheat oven to 375 degrees F. and line a large rimmed baking sheet with parchment paper. Set aside. As the oven warms, drain and rinse two cans of chickpeas. Transfer the chickpeas to a clean dish towel or stack of 2-3 paper towels. Using another dry paper towel or dish towel gently rub the chickpeas dry. The skins will start to peel off- that's ok. Transfer chickpeas to a large mixing bowl and gently toss with the olive oil, garlic powder, paprika, salt, and pepper. 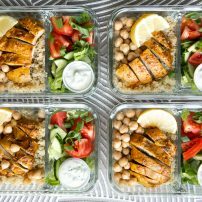 Transfer chickpeas to the prepared baking sheet in a single layer and bake for approximately 35-40 minutes, reserving the mixing bowl with any leftover oil or seasoning. Remove the chickpeas from the oven and allow to cool for 2 minutes before transferring to the mixing bowl and carefully tossing with the lemon zest and any remaining olive oil (I had approximately 1 teaspoon remaining). Transfer back to the baking sheet in a single layer and allow chickpeas to cool completely. Add all ingredients to a medium bowl and stir well to mix. Season with additional salt and pepper to taste (see notes). Preheat oven to broil. Line a baking sheet with foil and spray lightly with nonstick cooking spray. Roast bell peppers for 10-15 minutes, rotating every 5 minutes to ensure even cooking on each side. 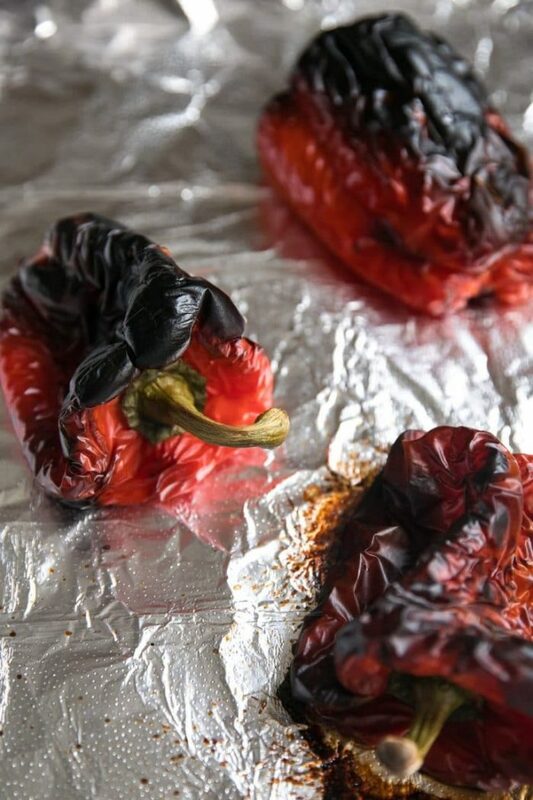 Remove from oven when peppers are charred and tender on each side. Carefully (the peppers will be hot) wrap the peppers in foil and allow them to steam for 5 minutes. Unwrap the bell peppers and allow to cool before removing the stem, scooping out the seeds and chopping into chunks. 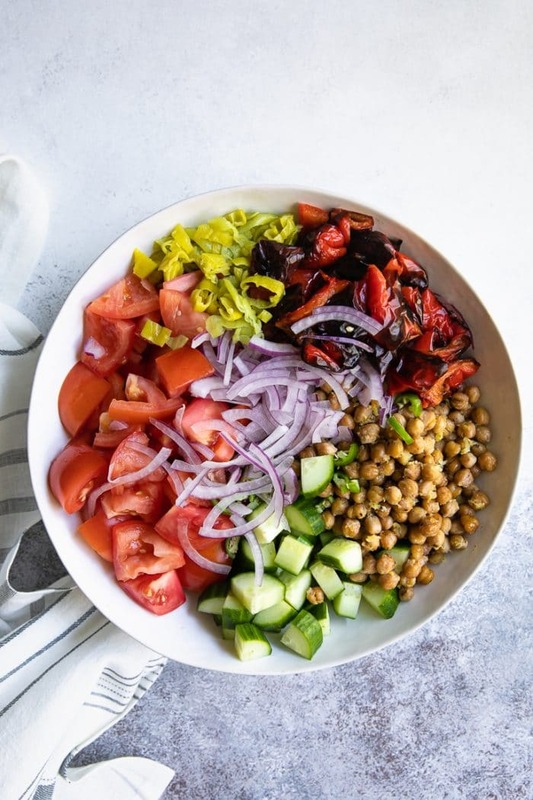 In a large salad bowl add the roasted bell peppers, tomatoes, cucumber, red onion, pepperoncini, serrano pepper, and fresh parsley. Gently toss to combine. Just before serving top with the crispy chickpeas and drizzle with the desired amount of homemade creamy yogurt dressing. I did not use a blender to blend together the yogurt dressing. If you prefer popping it all in a blender or food processor, that works, too. If you prefer not to roast your own red bell peppers, you can purchase pre-roasted red bell peppers from most major grocery stores. 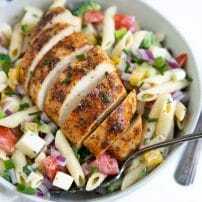 Recipe inspired by Lexi's Clean Kitchen. 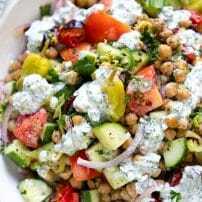 Want to try this Chickpea Tomato Salad? 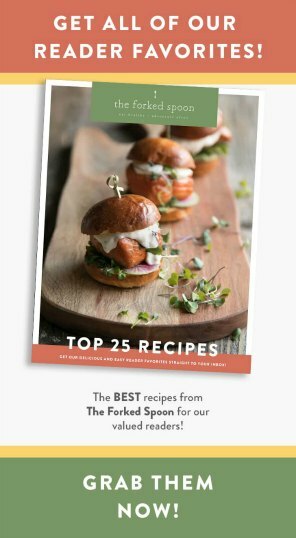 PIN IT to your SALAD or HEALTHY RECIPE Boards on Pinterest and save it for later! 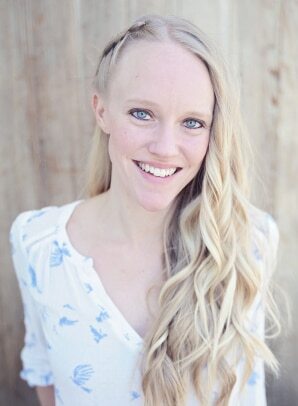 This was sooooo great for my pregnant sick body today – thank you!